“As a Buddhist, I wish you peace,” says a man’s voice on a grainy cell-phone recording. While the words wish peace, the tone says “back off,” as the man struggles to be heard over the clash of drum music to tell members of Utah’s Falun Gong community that they would have to leave despite being invited to perform their meditation exercises for the crowd at a Nov. 19 grand-opening celebration for an Asian retail mall in West Jordan. That a human-rights clash between the Chinese government and peaceful practitioners of the Falun Gong movement happened to open a new battlefront in the parking lot of Asian City, a large shopping center and food court, was bad news for business owners. A spokesperson for the business argues that they never intended to invite controversy to their celebration and thought they were booking performers to do a Tai Chi demonstration. “You have to understand that the Asian community as a whole works together as a community,” the man on the recording says before explaining that Falun Gong members couldn’t perform because of an “incident” in 2007 at the Utah Asian Festival, held annually in Sandy. 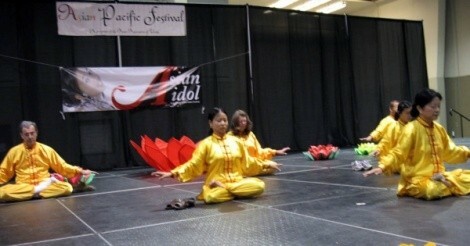 In 2009, festival organizers denied Falun Gong space at the Asian Festival, arguing that Falun Gong broke program rules in 2007 by failing to pay their fees and blocking sponsor banners during a performance demonstration of the group’s meditation exercises. Sheng Mei, a Utah Falun Gong practitioner—a group that claims fewer than 100 members locally in comparison to the estimated 100 million members worldwide—says the Asian Festival incident was discrimination; he recorded the confrontation and played it for City Weekly. Armed with copies of the checks cashed by festival organizers to prove the group had paid their fees and with a photo showing meditating performers were not blocking the festival’s banner, Mei says the long reach of the Chinese government helped yank his group from the 2009 festival and had now forced them offstage from the Nov. 19 celebration. “These people have been brainwashed by Chinese propaganda,” Mei says. Falun Gong has long had a difficult relationship with the Chinese government, ever since the movement’s birth in the aftermath of the Tiananmen Square protest of 1989. Founder Li Hongzhi based Falun Gong on the ancient Chinese philosophy of “Cultivation,” a practice that emphasizes personal moral development used in various forms by thinkers like Confucius. Members practice exercises that combine meditation and slow Tai Chi-like movements as part of their belief system. The movement’s explosive growth from a cadre of Li’s followers to as many as 100 million practitioners by 1999 is what set the movement up for a showdown with the Chinese government, which viewed the movement as a seditious cult. Media accounts have documented widespread persecution of members by the Chinese government. In 2009, The New York Times cited experts who said that 8,000 practitioners had been detained, with as many as 100 dying in custody in China in 2009 alone. But Asian City’s Tian says her company hired an event planner who was unfamiliar with Falun Gong and mistakenly booked the group to perform a Tai Chi demonstration. When some in the crowd spotted the members’ uniforms carrying the name Falun Gong, they complained to the planner. Tian says the members were asked to wear different uniforms if they wanted to perform their demonstration—they declined, she says, and the group left peaceably. She adds that company owners were busy inside the store and weren’t involved in the arguments between Falun Gong members, the event planner and the man on the recording claiming to speak for the Asian community. For Falun Gong practitioner Mei, however, it’s not his beliefs that are political.